Left: Saladin. Francesco Gasparetti - CC-BY SA 3.0 Right: The Siege of Acre, miniature from a medieval French manuscript. During the Third Crusade, the city of Acre (today in Israel) was surrounded. Occupying the city was a Muslim garrison, besieged by a Christian army, in turn, surrounded by a Muslim force. It was a stalemate. So what finally ended it? Bees. 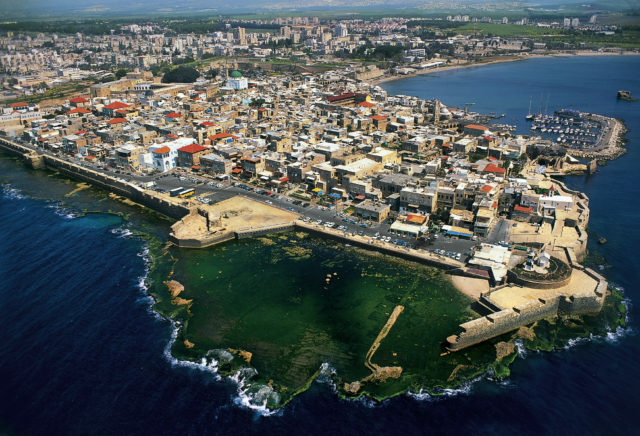 Acre is one of the oldest, still inhabited cities in the world. It may have been founded as far back as 4,000 years ago. Its success lies in its location on the northern extremity of Haifa Bay along the Mediterranean Sea. It has a natural harbor, which is why just about everyone has fought over it – Persians, Greeks, Romans, etc. The Byzantines held Acre until 638 when they lost it to the Rashidun Caliphate. The new rulers turned it into a naval base in 861, but they lost it to the Europeans during the First Crusade (1095–1099). King Baldwin I of Edessa, Boulogne, and Jerusalem captured it in 1104. He turned it into Palestine’s chief port and the Crusader’s primary gateway to the rest of the Levant. Acre also gave the Europeans access to the Asiatic spice trade which helped finance their expansion and continued grip over the region. In 1187, the city surrendered to the Ayyubid sultan An-Nasir Salah ad-Din Yusuf ibn Ayyub; better known in the West as Saladin. King Guy of Lusignan tried to get Acre back by besieging it in August 1189 during the Third Crusade (1189–1192) but to no avail. King Guy, therefore, camped around the city as he waited for reinforcements from Europe. They arrived days later by sea, so Saladin sent troops to help his beleaguered city. As a result, the besieging Europeans found themselves besieged. Saladin attacked the European’s camp on September 15 but was repelled. He regrouped his army in a semicircle to the east of Acre and launched his second attack on October 4. Sandwiched between the city and Saladin were the Crusaders made up of about 7,000 infantry and 400 cavalry. Turning their backs on the city, the Crusaders placed their crossbowmen at the front with heavy cavalry behind. With arrows creating a breach in Saladin’s front lines, the Crusaders’ cavalry did the rest, forcing the Muslims back. 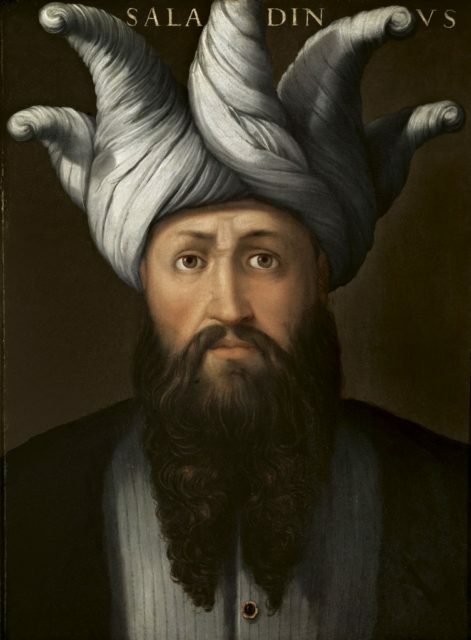 Saladin by Cristofano dell’altissimo, 1568. In the chaos of their retreat, men, horses, and equipment were left behind. The Crusaders could not resist. They broke ranks and began looting, while others staggered back to their camp laden with booty. The European army had turned into a rabble. Saladin’s cavalry then charged the Europeans as they made such easy pickings. In response, King Guy sent his Templars to the rescue; exactly what those in the city were waiting for. The gates opened and troops poured out to cut the Templars down, as well as the stragglers with their booty. Others veered toward the main European camp, but the latter were too well entrenched, forcing the attackers back into Acre. With their retreat, Saladin lost his chance to squeeze the Europeans between his two armies, but they were still trapped. Muslim galleys broke through the Christian sea blockade on October 30 to supply Acre with food and weapons. By December 17, another fleet pushed the Christians out of the port and reestablished control over the road leading to the city. More arrived to boost both Saladin and the European’s position, but it was no longer a stalemate. Saladin was on home turf and had access to plenty of food and medicine. The Europeans meanwhile were succumbing to disease. Desperate, they made another attempt to breach Acre’s walls on December 31 and again on January 6 – causing damage, but not enough. 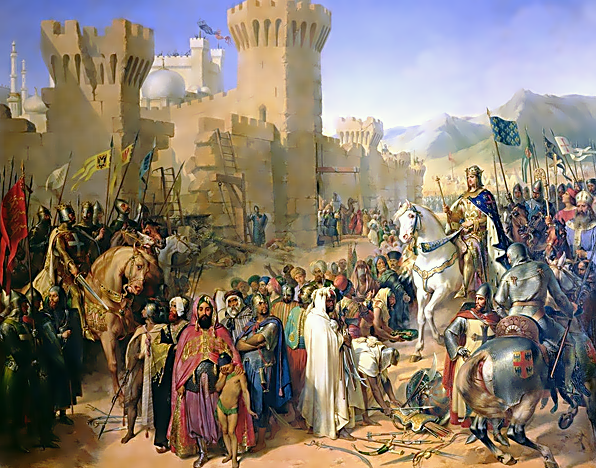 Saladin broke through the Christian lines on February 13, 1191, and made it into Acre to replace the exhausted forces. It was a blow to the Europeans, but they stayed put. 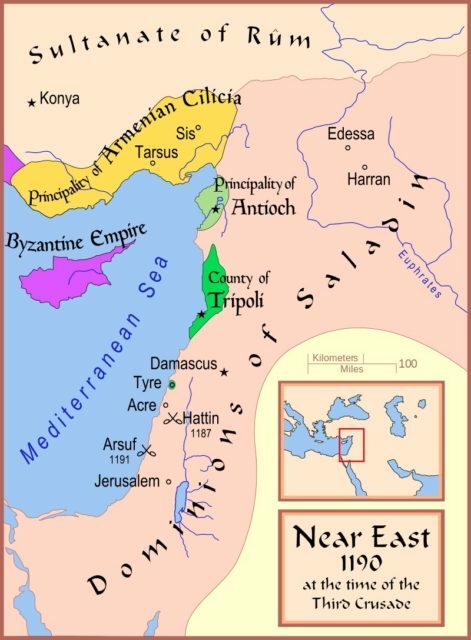 By March, the weather had improved and more ships from Europe and the Crusader states made their way to Acre. Saladin had lost the initiative. 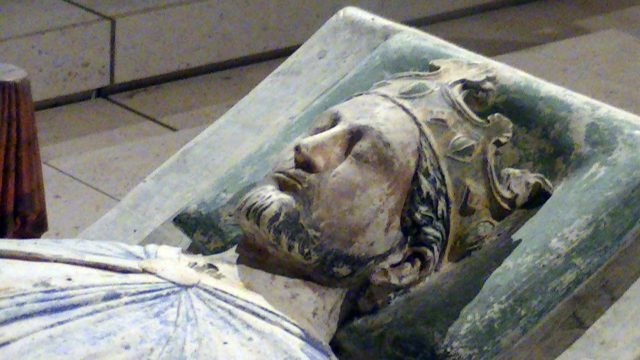 Enter Richard I, King of England – better known as “Cœur de Lion” or “Richard the Lionheart.” Despite his title, he spent most of his life either in France or fighting in the Crusades. Having taken command of an army at age 16 and putting them to good use quelling rebellions in France, fighting was something Richard was very good at. 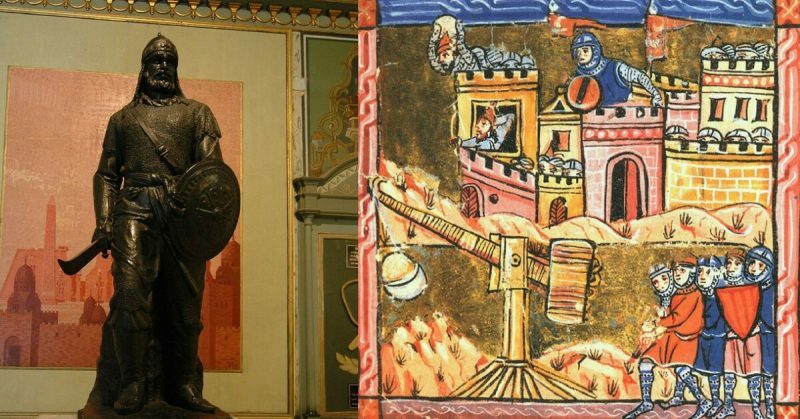 He arrived at Acre on June 8, 1191, having conquered Cyprus. He had been preceded by King Philip Augustus of France who built siege engines and launched an attack on Acre on June 17. Every time they broke through a wall, however, Saladin attacked, giving his defenders time to repair the breach. The citizens of Acre were exhausted. The arrival of so many Europeans meant Saladin had lost his advantage. Nor could he break through the European lines to resupply the city. Desperate, the city offered to surrender on July 4. King Guy had been ousted, and Richard was temporarily in charge, but he was unhappy with Acre’s terms. So the city sent Saladin a final ultimatum on July 7 – save us or we open our gates. However, Saladin could do nothing as more European ships appeared in the port. Getting impatient, Richard launched his secret weapon. One hundred ships carrying 8,000 men had left England for France to meet with Richard. From France, they had sailed with additional ships, some of which carried beehives and their keepers. On July 11, trebuchets hurled those hives into the city. The bees were not at all happy with their treatment so they took their wrath out on the defenders who were even less happy. Acre surrendering to Philip Augustus in 1191. It gave the Europeans the chance they needed. Breaching the city’s gates, they poured through… only to be greeted by a swarm of still angry bees. The result was a chaotic and hasty retreat. Acre had had enough. The following day, it offered new terms of surrender which Richard accepted. The bees had dissipated by then, allowing his men to enter the city and garrison the Muslims. Saladin delivered the first of three payments for his captured citizens on August 11. Christian nobles were to bring the money but they did not arrive. Richard waited nine days, and when they did not turn up, slaughtered his Muslim captives. Leaving Acre to other nobles, he then went off to conquer more cities… although it is not clear if he took any bees with him.